Last weekend saw a record breaking performance for the month of February, albeit from a terrible film. Despite that film's impending enormous dropoff, the three new wide releases (which may not be any better, to be fair) combined won't match its total this week. Such is the slate of the early part of the year. Likely leading the way is a film that must have studio execs looking around at each other saying, “Wait, I thought *you* greenlit that! 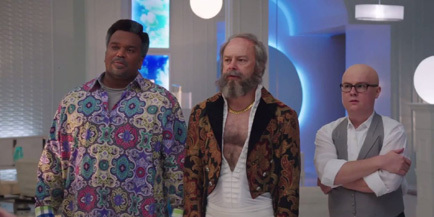 If you didn't, then...” Hot Tub Time Machine 2 is the sequel to the 2010 film that essentially exists as a dare to see how dumb of a premise can get made into a major feature. Although it had some charm, there wasn't a lot to write home about, and it could have been easily filed under the “harmless and mildly enjoyable” file, despite the ludicrousness of the setup. Then it made $50 million on a $30 million budget, so now we have Hot Tub Time Machine 2. Made for an even cheaper amount, possibly due to shedding John Cusack (although I don't think he was pulling eight-figures or anything), it sends Craig Robinson, Rob Corddry, Clark Duke (at least, the 1980s alternate universe versions of them) and newcomer Adam Scott into the future to solve the mystery of who shot Corddry in the testicles. Heady stuff, this. Loaded to the brim with “wow, the future is sure different” gags, plus a bevy of vulgar and raunchy jokes that take a look at the lowest common denominator and say “We can dig below that!” I'm struggling to find a reason for this film to exist, and it's maybe for Corddry to go full bore on his psychopathic Peter Pan shtick, which even then is stretching. Still, it's a brand, and presumably has some fans looking for a retread of the non-Cusack parts of the original. I'd look for about $9 million here.